Banana pancakes have long been a favorite in my home. 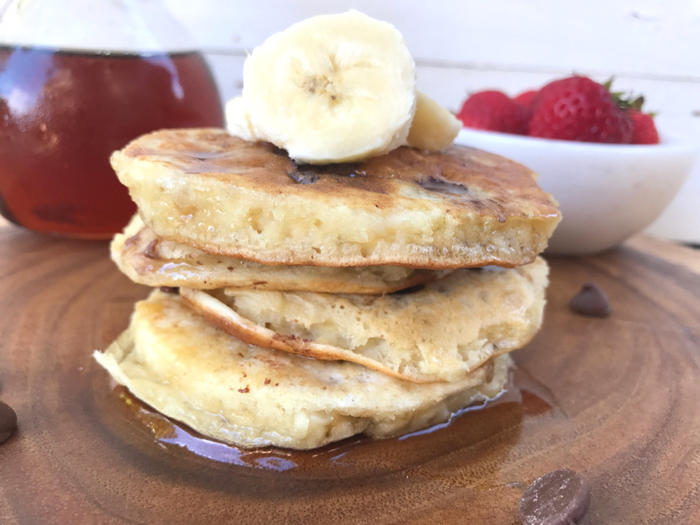 The addition of ripened bananas makes a classic breakfast just a little sweeter. My kids especially love them when I sprinkle in a few chocolate chips! If you’re currently making pancakes using a store bought mix I bet you’ll be surprised by just how easy it is to make them from scratch. It’s truly not hard! 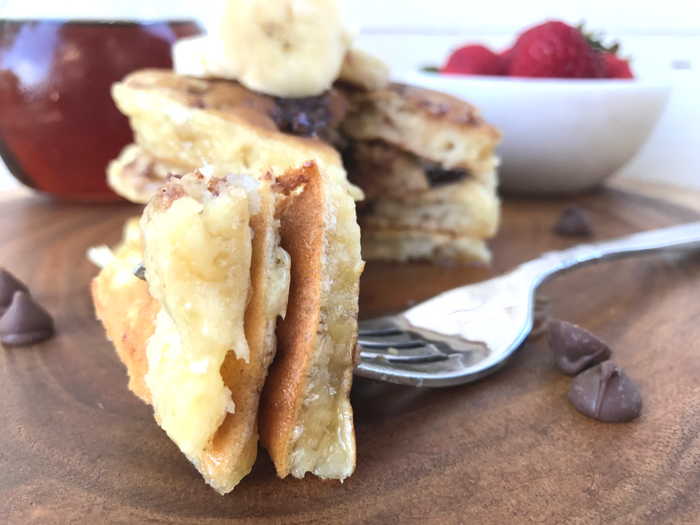 You’ll feel great knowing exactly what ingredients are in the pancakes plus you likely already have everything you need on hand! This recipe uses only 8 ingredients and takes about 20 minutes to make. Here’s a quick tip for you! I add a small dab of butter (ghee or coconut oil works great too) to my nonstick pan before adding my pancake batter. It flavors the entire pancake far better than spreading butter on after it’s cooked (we skip that) and your kids may consume a bit less butter this way. I don’t know about you but mine can get heavy handed with the butter knife. 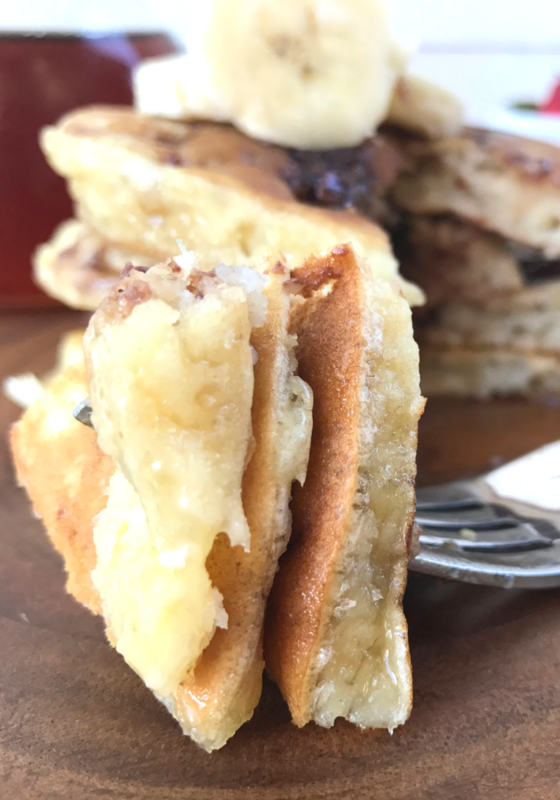 These pancakes are just perfect on the weekend when the whole family is together or on a weekday morning if you have a few spare minutes. I so hope you enjoy them as much as we do! 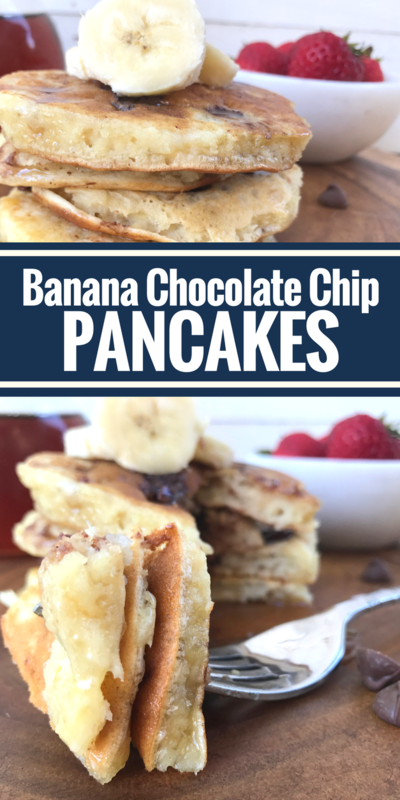 Your family is sure to love these Banana Chocolate Chip Pancakes. They're so fluffy with just the right amount of sweetness to make any morning extra special! Combine your flour, sugar, baking powder, and baking soda. Stir. Stir in your beaten egg, milk, and mashed bananas. For each pancake pour about a ¼ cup or less (depending on if you like smaller pancakes) onto a hot skillet or griddle. I prefer a nonstick pan with a small dab of butter. Sprinkle a few chocolate chips on the side facing up. Cook on each side on medium heat until your pancakes are a golden brown.This typically takes approximately 2 minutes per side. Top with syrup, sliced bananas, and a few chocolate chips. This sounds so easy to make!!!!!!! (Although I usually go for the “just add water” pancake mix, ha!). I’ll have to try these! I haven’t eaten all day and this looks and sounds soooo good! We love banana pancakes. I’ll have to try out your recipe. They look delicious! I haven’t made pancakes in a while. I am going to have to make these soon! I love the idea of using banana as the main sweetener. Sent this to the boyfriend and was sent back a photo with those mock puppy dog eyes looking so hopeful and expectant. Guess I know what I’ll be making him next time I head down to visit! My babysitter was the first one to give my son banana pancakes, but he has been in love ever since! Ohhh yum! This is just what I need to make next weekend for breakfast! 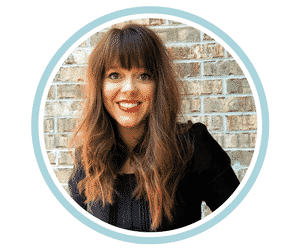 I have been trying to make new things – tired of the same old eggs and bacon – thank you! This is what I order at my favorite breakfast restaurant, I should try making it at home.